April turned out to be a whirlwind month rather than a showery one. The month opened with a not-April-fool article in Banking Technology, co-written with my friend Bob McDowall and published promptly courtesy of my friend, editor David Bannister. This article set the tone for a whole series of meetings and initiatives around blockchain technologies. Equally interesting though have been the numerous reactions to Z/Yen’s publication of Global FInancial Centres Index 15 showing London pipped for the top spot by New York City. Long Finance & Qatar Financial Centre Authority (March 2014), 58 pages. “From January to June 2013, the UK media had headlines such as “Google, Amazon, Starbucks: The rise of ‘tax shaming’” (BBC), and “David Cameron: Tax avoiding foreign firms like Starbucks and Amazon lack ‘moral scruples’” (The Telegraph). In late June 2013, Starbucks agreed to pay £10 million to the UK Treasury. Given that Starbucks reportedly paid no tax in the previous four years, £8.6m in corporation tax in the UK over the previous 14 years, yet had sales in the UK of £400m per annum, this might sound like a victory over tax evasion. a mistake, an adjustment to historic tax liabilities, or a retroactive tax? a bonus payment or donation to HM Revenue & Customs? a donation or bribe paid to the UK coalition government, or perhaps David Cameron’s Conservative Party? a shakedown or protection racket payment to a corrupt government? Socially, April was much more upbeat. There was the whirlwind contrast of greeting the President of Ireland, Michael Higgins, and the Taoiseach, Enda Kenny, at Mansion House and Guildhall, with the celebrations of St George’s Day. It was quite emotional hearing the Irish National Anthem, “Amhrán na bhFiann”, being played in the Guildhall in honour on the evening of 9 April. Something I never expected to hear three decades ago, yet also a sound that still discomfits those who lost loved ones during the Troubles. The Lord Mayor’s excellent speech on the night says it all. Increasingly emotional too were this year’s celebrations in honour of St George’s Day, 23 April. Three decades ago it was not a day one heard much about. Today, there isn’t a patriotic pub not festooned with flags. I attended two notable events. Courtesy of Dudley Edmunds, I was able to hear a wonderful talk from the last of the dambusters, Johnny Johnson. Bright as a button and with a deft touch to his talk, Johnny made you realise what a group of determined young men could achieve, and still retain their humanity, as he related the story of 617 Squadron’s May 1943 raid. 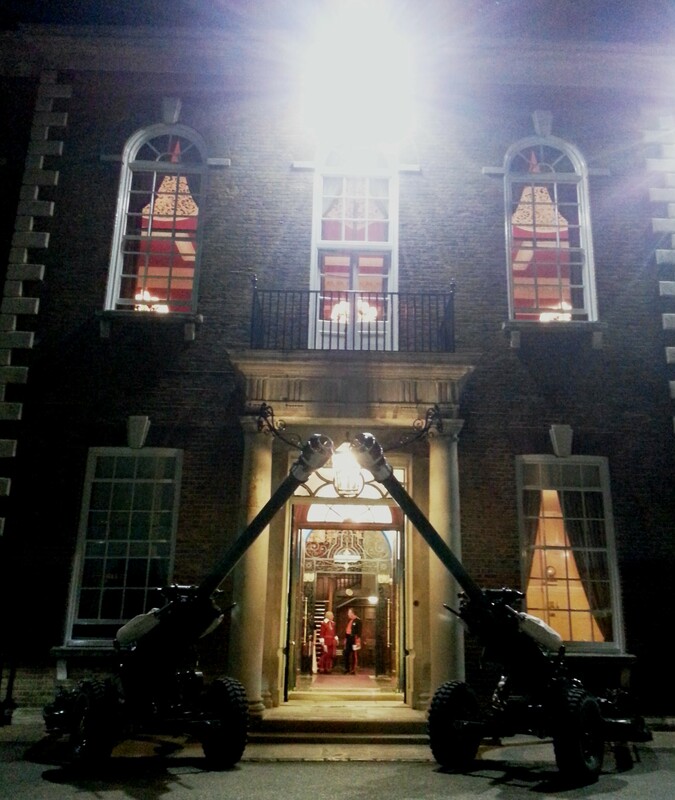 The second event was the St George’s Dinner at the Honorable Artillery Company which I attended for the first time in an ex officio Aldermanic capacity in Old Bailey velvets. The female officer toasting the guests reminded the guest of honour, the US ambassador, that the Company and the USA had had some low and high points in their relationship, such as burning the White House in 1814, though she left us a bit misdirected about high and low. We concluded the dinner with three rounds singing Rule Brittania, Land of Hope and Glory, and Jerusalem along with the band and accompanied by the American ambassador, which wound up with us standing on the tables in formal wear and waving our napkins. The photo above was taken as I left about midnight, outsung and outdrunk by men and women who’d entered military service in the 1940’s and 1950’s.